You've asked for it and here it is! Many of you have asked for a tool that would allow you to cut 60° diamonds in different sizes. I've been working on it for many months and it is finally ready! With the 60° Diamond cutter ruler, you can rotary cut diamonds from 1" to 4". Use for Split Diamonds too! If you have taken the class Patchwork Illusions or More Patchwork Illusions, this is for you. 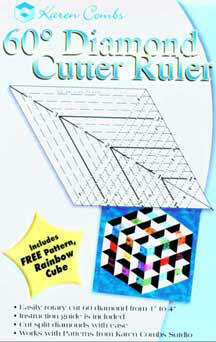 Use the ruler for Optical Illusions quilts, tumbling blocks and other traditional 60° blocks. Includes complete instructions for strip cutting, size changes and includes free pattern! Click here to view the 60°Diamond Cutter Ruler. The newly designed Value Viewer! Become an expert at fabric selection - instantly! This is the value tool I use whenever I select fabrics for a quilt. Place the tool up to your eye and look through it. 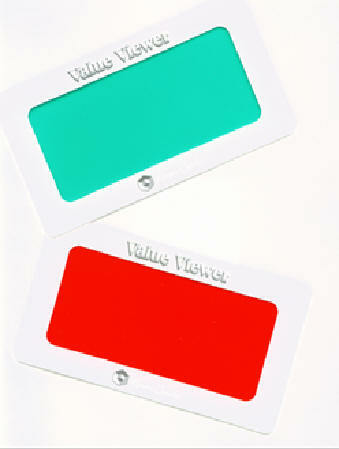 This "removes" much of the color of the fabrics and you can see the value of the fabric. This tool helps you determine whether your fabrics are light, medium or dark. This ruler is a perfect match for the techniques shown in my book "Combing Through Your Scraps." 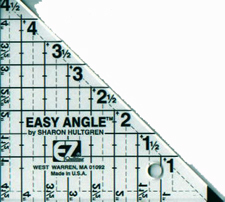 All you need to do is cut one size strip, with this tool, you can cut your squares AND half-square triangles. No more cutting two size strips. Save time with this tool! Cut triangles, squares and attic windows shapes all from the same strip of fabric! 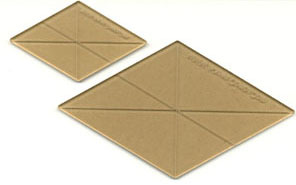 Cut squares and half-square triangles from 1/2" to 4" (finished size.) Ideal for use with the rotary cutter. Built in 1/4" seam allowance. These rotary templates are used in Karen's Online classes, many of her patterns and in the Patchwork Illusions/ More Patchwork Illusions techniques. Isometric Graph paper is hard to find. I know, I've searched everywhere to find it! I finally decided to design my own graph paper and here it is! This graph paper is two-sided, one side has a larger grid and the opposite side has a smaller gird. For use with pencil, colored pencils, pen or fine tip markers, the lines are light enough they do not interfere with your drawing. This hard-to-find item is what I use to draw all my 3-D patchwork designs on. Perfect for designing 3-D cubes, hexagon quilts, tumbling block designs or quilts of illusion using isometric perspective as described in my books Optical Illusions for Quilters or 3-D Fun with Pandora's Box. Stand close to a quilt and this lens will show you how it will look when viewed from a distance. A must have item!! I use it to check out my quilts as I am putting them on my design wall. I also use it to check out fabric before I cut it into a quilt.